We are down to the final 57 players in the $400 Deep Stack event. The final 35 will finish in the money. The average chip stack is approximately 122,000 with the blinds at 2,000-4,000 with a 500 ante. Ronnie Pease, who chopped the 2011 Foxwoods Poker Classic Main Event, looks to be near the chip lead with 264,000 late on Day 1. The remaining 138 players in the $400 Deep Stack event have returned from dinner break and play has resumed with the blinds at 600-1,200 with a 200 ante. 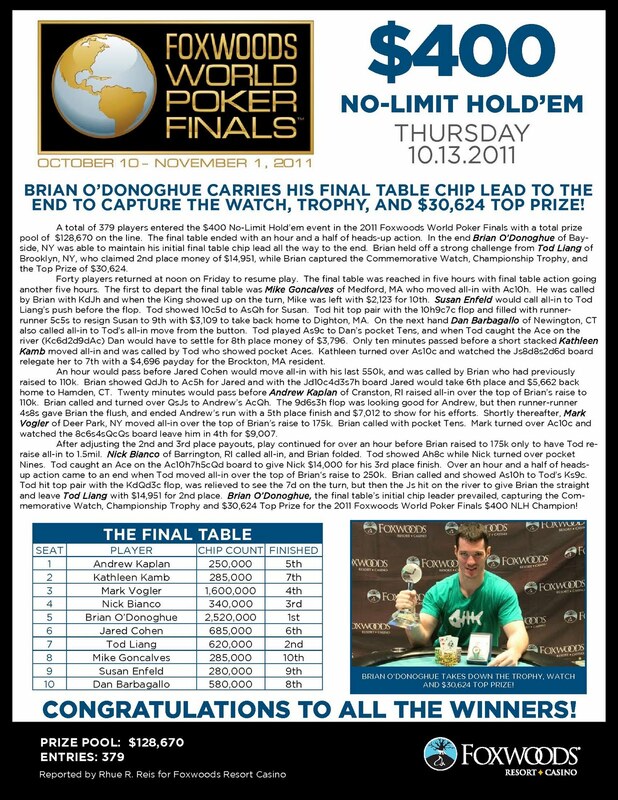 The average chip stack is now 50,500. James Woods comes back from dinner as one of the chip leaders with 130,000 in chips. Chris Morse Wins the $400 Pot-Limit Omaha Event! 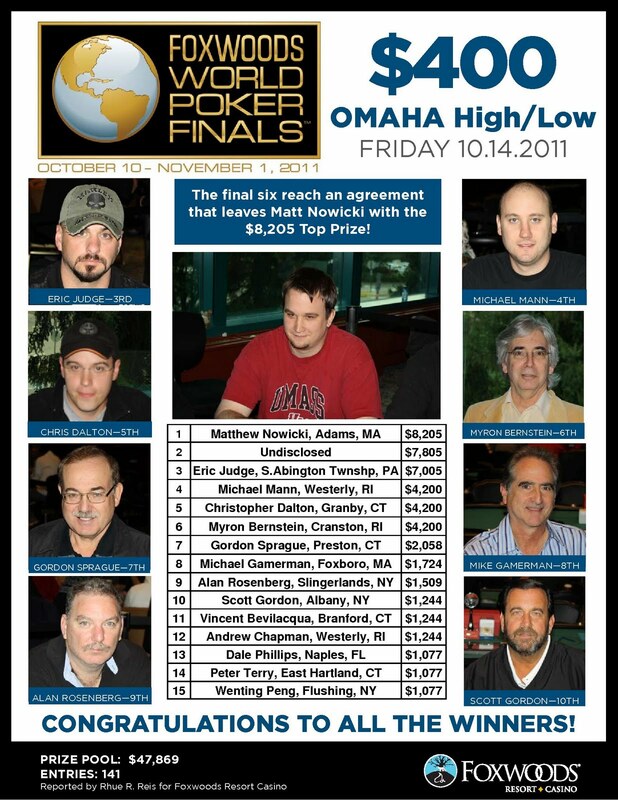 The final nine players in the $400 Pot-Limit Omaha High event came to an agreement on a chop and played out the tournament to determine a champion. Chris Morse came out victorious and is officially the champion of the $400 Pot-Limit Omaha High event. He takes home $5,000 and the World Poker Finals Trophy. We had a total of 349 players in the $400 NLHE Deep Stack event at the Foxwoods World Poker Finals. Jason Laramee is officially the champion of the $300 Deep Stack No-Limit Hold 'em event. He takes home $27,761, the World Poker Finals Trophy and the watch! Arch has the lead with a pair and maintains his lead after a flop of [Th][8s][6h]. The [Js] on the turn gives Laramee an open ended straight draw along with his two over cards. Laramee wins the hand when the [Kd] falls on the river, giving him a pair of kings. Eric Arch is eliminated in 2nd place for $15,943. On a board reading [Ac][As][4s], a short stacked Amanda Mangas gets her last few chips in the middle with [7c][4d] against the [Ad][6s] of Jason Laramee. The turn is the [Qs] and the river comes the [Td]. Laramee's trip aces win the pot to eliminate Mangas in 3rd place for $10,134. The board runs out [Kh][7c][7s][5h][5s] and Laramee's pocket tens hold up to knock out both Miller and Solerti. 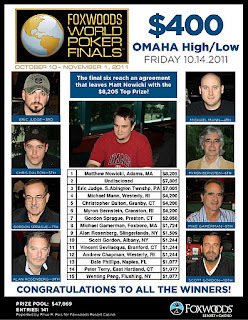 Miller takes fourth place for $8,096 while Solerti finishes in 5th place for $6,282. Pete Young gets his last few chips in the middle before the flop with [Ah][Js] against the [Jc][Jh] of Eric Arch. The board runs out [9s][8h][7h][Jd][Qd] and Young is eliminated in 6th place for $5,038. The board runs out [Ts][9s][3c][5d][Ah] and Laramee's kings hold up to win the pot and eliminate Tekneci in 7th place for $4,089. The river is the [7s] and Laramee's two pair takes the pot to eliminate Bianco in 8th place for $3,260. Marty Rawitz moves all-in for his last 155,000 and is called by both Jimmy Solerti on the button and Jason Laramee in the big blind. They both check a flop of [Kc][3d][2h] and the [6c] falls on the turn. Laramee bets 100,000 and Solerti mucks his hand. The river comes the [Tc] and Laramee wins the pot to eliminate Rawitz in 9th place for $2,679. We have reach the final table of the $300 Deep Stack No-Limit Hold 'em event with nine players remaining. $300 Deep Stack Now Streaming Live! 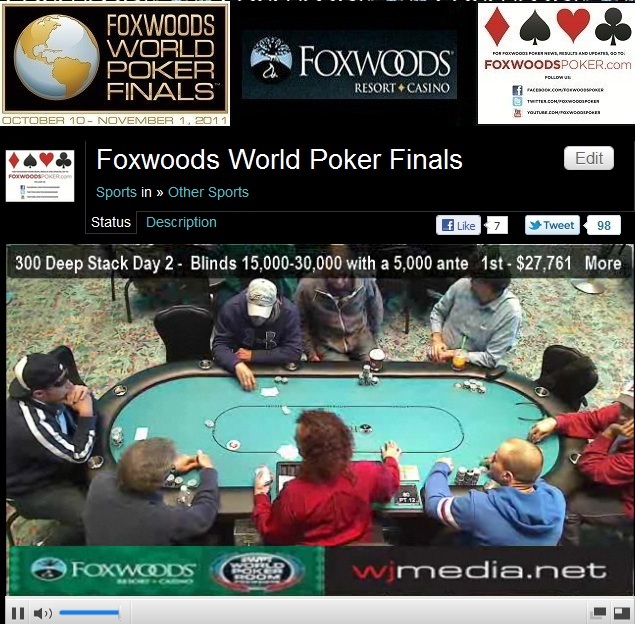 The final day of the $300 Deep Stack event is now streaming live. The $400 Deep Stack No-Limit Hold 'em event is about to get underway.